The National Association for Community College Entrepreneurship (NACCE), the nation’s leading organization focused on promoting entrepreneurship through community colleges, has named five community colleges as institutions demonstrating entrepreneurial excellence during the Entrepreneurial College of Excellence Awards breakfast at the American Association of Community College’s (AACC) annual conference today in Orlando, Florida. 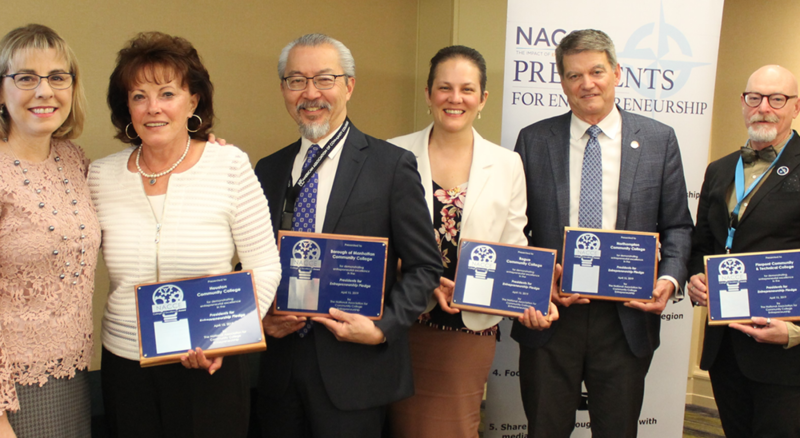 NACCE is an organization of educators, administrators, presidents and entrepreneurs focused on inciting entrepreneurship in their community and on their campus. NACCE has two main goals: to empower the college to approach the business of running a community college with an entrepreneurial mindset; and to grow the community college’s role in supporting job creation and entrepreneurs in their local ecosystem. The association represents 300+ community and technical colleges and 2,000 faculty, staff, administrators and presidents who serve more than 3.3 million students.